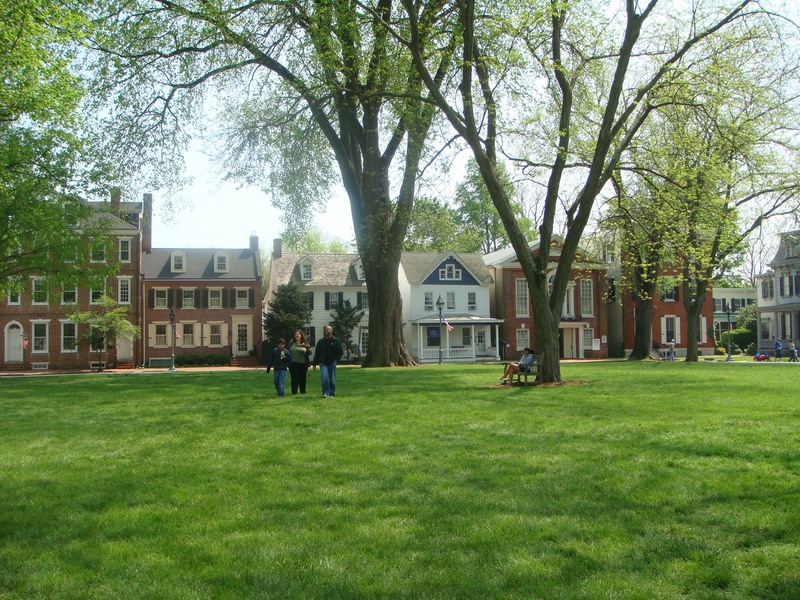 The Dover Green, a National Register Historic District, is centered on the public square laid out in 1717—the original commercial and residential heart of Dover. It was at the Golden Fleece Tavern on the Green that Delaware became the “First State” to ratify the U.S. Constitution in 1787. Founded by William Penn in 1683, Dover, Delaware, (population 34,120) first served as the seat of state government in 1777, becoming Delaware’s permanent capital city in 1781. Dover experienced substantial economic growth fueled by agriculture after railroad service reached the city in 1856. The town’s greatest periods of expansion occurred in the 20th century. Dover Air Force Base, first activated during World War II, has become one of the world’s largest military freight terminals and has contributed significantly to the local economy. Today, small businesses and more than a dozen major employers provide Dover with a diverse economic base that includes government, higher education, and manufacturing. The First State Heritage Park at Dover links nearly two dozen sites in the town’s historic core, including two state capitol buildings, three 18th century churchyards, and the historic Green. Interpreters in 18th century dress offer nearly a dozen walking tours. The Old State House has been restored and is open to the public, and the restored mid-18th century John Bell House, Dover’s oldest surviving timber-frame structure, will serve as an interpretive center for the park. Among Dover’s museums are the John Dickinson Plantation (1740) and the Dover Air Force Base’s Air Mobility Command Museum. First observed in 1933, the annual Old Dover Days event celebrates the town’s history with maypole dancing, colonial craft demonstrations, walking tours, and a parade. Another annual event, the African American Festival: Positively Dover, celebrates the contributions of African Americans to Dover’s history.